Welcome to Scranton made a cameo appearance on TV in one of Liz Randol’s political ads during the recent primary election campaign. Randol ran for Lackawanna County Commissioner. The ad, which shows Ms. Randol holding a copy of the novella while speaking with a group of young women, was replayed over and over every day in the first half of May. 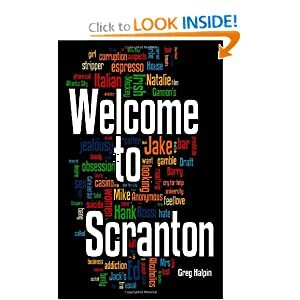 I couldn’t have asked for better publicity for Welcome to Scranton, except perhaps for the book to appear on an episode of the TV show The Office. I have never met Ms. Randol and do not know her positions on the issues, nor did I endorse her. But I am in favor of all candidates holding my book in their TV ads, regardless of their political persuasion–Democrat, Republican, Libertarian or vegetarian. The Scranton Times-Tribune reported that Randol won in Scranton and the Abingtons, was second in Dunmore, but came in fifth in Carbondale. County-wide, Randol came up just 403 votes short of edging out Commissioner Corey O’Brien, meaning she won’t be on the Democratic ticket in November. It must be disappointing for Ms. Randol. But we may see her again, given her strong showing in Scranton. Perhaps she’ll run for Mayor in the future. I’m hoping she does so she can run more commercials featuring Welcome to Scranton. Take a look at the ad below and see the cover of Welcome to Scranton 17 seconds into the video.